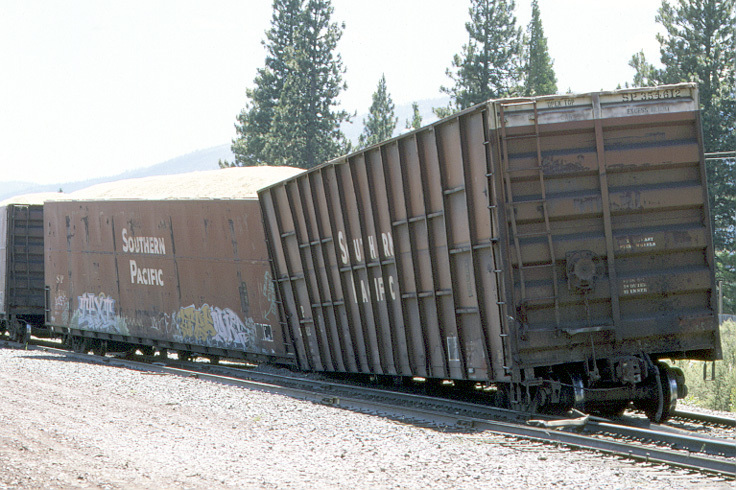 The rails in the vicinity of Black Butte have been described as a "Bermuda Triangle" for trains. And it does seem as if, over the years, there has been an unusual number of derailments, some quite serious, in the vicinity. The most recent major mishaps, in May and June 2009, were just the latest in a long-running series. 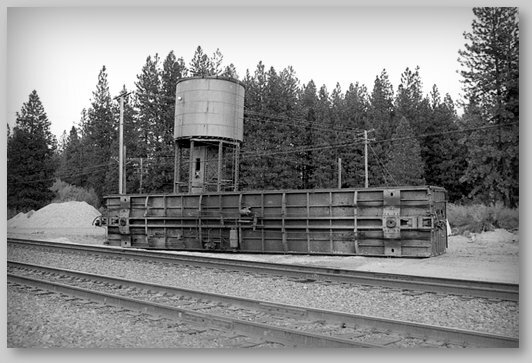 On this page we documenting the derailments and train wrecks that have occurred at or near Black Butte over the years. If you have info on any of these or other derailments or, better yet, have some photos to contribute, please let us know. The following photos and information are in chronological order, starting with the oldest incident we know about. 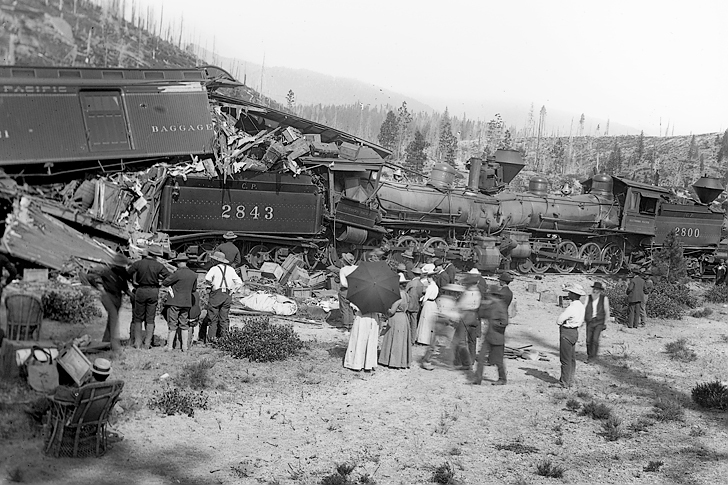 July 6, 1901: According to the Redding Spotlight and other sources, two passenger trains collided head-on at Black Butte Summit after a possible switch failure or a miscommunication. Five of the six engineers saw the danger and jumped from the trains to escape injury. Floyd Rankin, a 19 year old traveling cigar salesman from Fort Madison, Iowa, was killed in the wreck. He was most likely "riding the blinds" (in the front doorway of the baggage car behind the tender of the steam locomotive), a common practice among hobos at the time. The following three photos were taken the next day, on July 7, 1901, by Lewis Josselyn. Collection of California Views Historical Photos (www.caviews.com), used by permission. Winter of 1952-53: During a fierce winter storm, right as steam locomotive operations were coming to an end on the Siskiyou Line, a Class F 2-10-2 steam locomotive (known as a "deck") left the tracks at the derail on the storage track at Black Butte. Rather than re-railing the surplus locomotive, the SP waited until the snow cleared and then scrapped it on the spot. (reference: John Signor, Rails in the Shadow of Mt. Shasta, p.191). 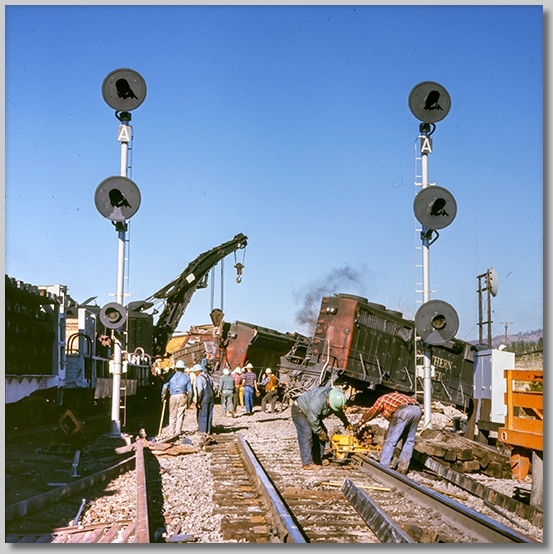 October 31, 1970: In the early morning hours of Halloween, 1970, a southbound freight traveling at road speed on the mainline hit two derailed cars on a northbound right at the Black Butte crossover. Two locomotives and over 30 cars derailed. 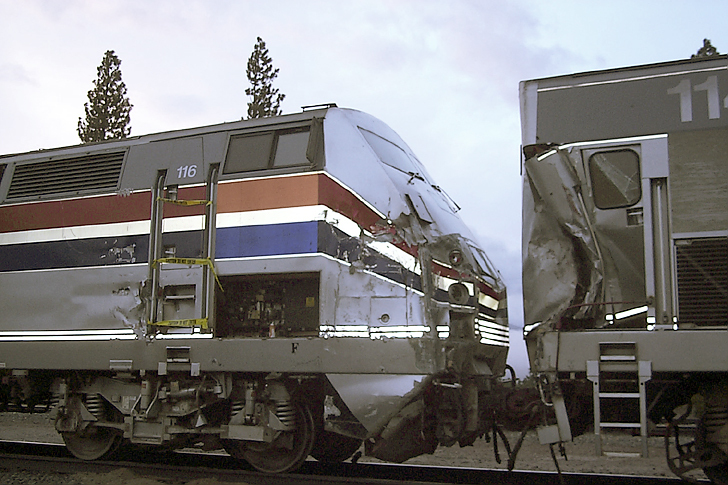 The accident destroyed the Black Butte train orders office. The office had been taken out of service in 1966 so nobody was in it at the time. 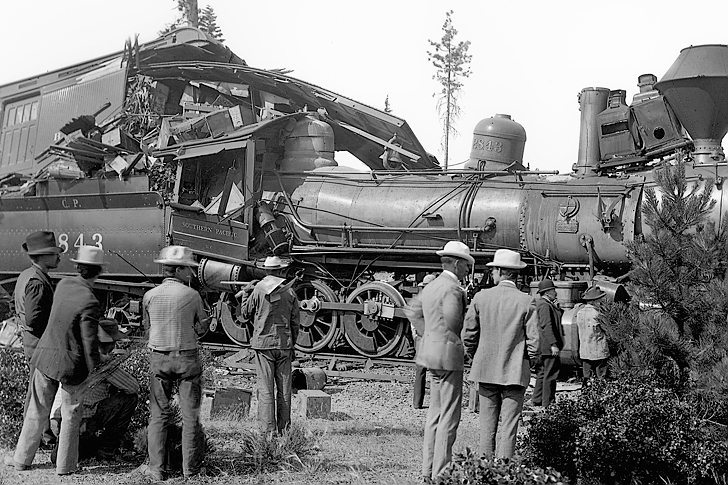 The wreck was witnessed, however, by several Southern Pacific railroaders and their families who still lived in the railroad-provided housing that stood east of the tracks and north of Black Butte Creek. 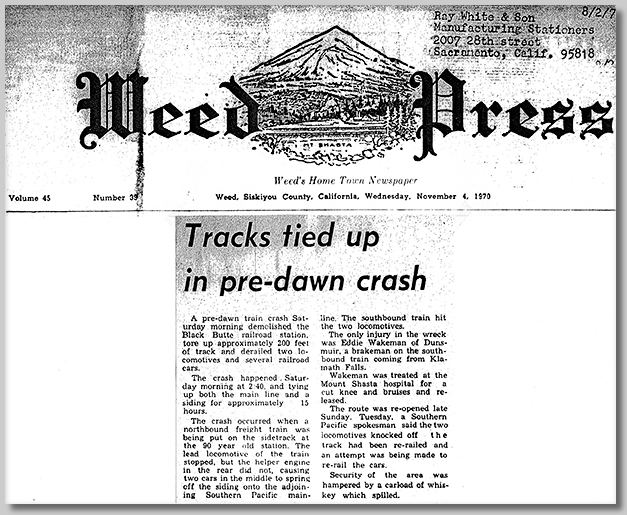 According to both local legend and a report in the November 4, 1970 Weed Press, a boxcar full of whiskey spilled in the derailment. Reportedly, it was buried in the area. 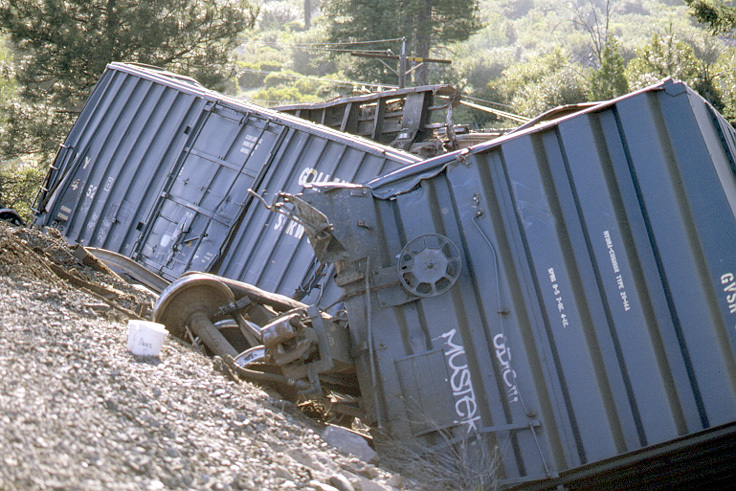 One of the casualties of the October 31, 1970 wreck was a boxcar loaded with cases of whiskey. After an initial "feeding frenzy", those lucky enough to be nearby, local officials, and rail police moved in and order the car and all its contents to be buried. 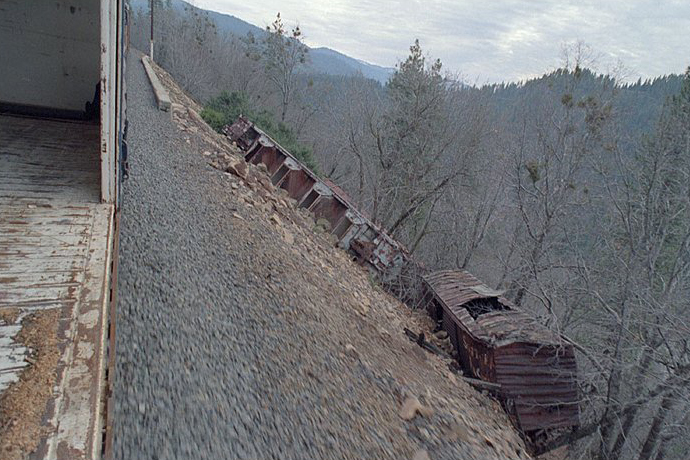 1970s: At some date in the 1970s, a train derailed below "Sawmill Curve" above the Sacramento River canyon between Mt. Shasta and Dunsmuir. Some of the derailed cars are still visible below the tracks. 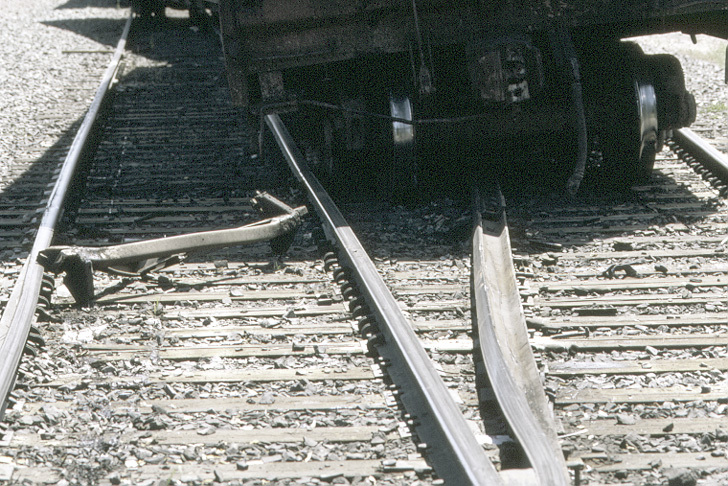 October 23, 1978: A train ran through the signals at Black Butte and caused a sidelong collision. 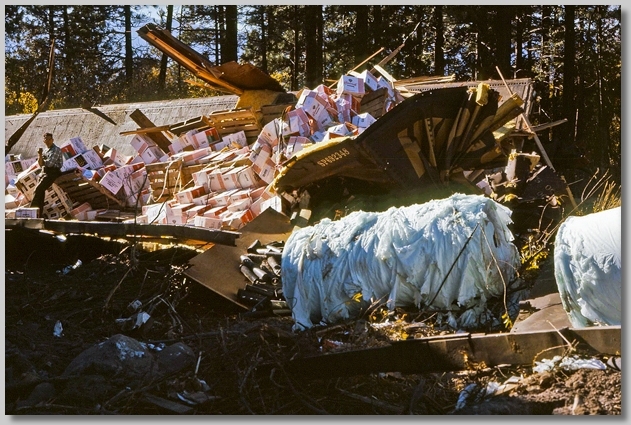 November 26, 1978: 13-car derailment at Andesite siding, north of Black Butte, caused by a hotbox on a gondola car. July 14, 1991: Probably the most infamous derailment in the area occurred at the Cantara Loop bridge over the Sacramento River when a Southern Pacific freight train derailed and dumped a tank car of toxic soil sterilizer right into the river. The resulting contamination killed fish and vegetation on a long stretch of the river through Dunsmuir and the fumes sickened people in the area. The spill had a major economic impact on Dunsmuir and the SP ended up paying millions in damages. June, 1996: Two CORP locomotives (GP38 #3081 and GP40 #1353) derailed in Weed. 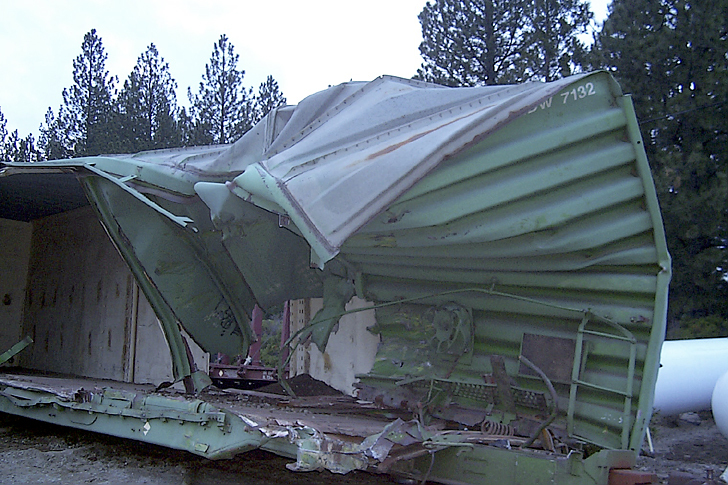 July 1996: Several cars on a freight train derailed, apparently from "string-lining", a couple miles north of Black Butte at about milepost 347. 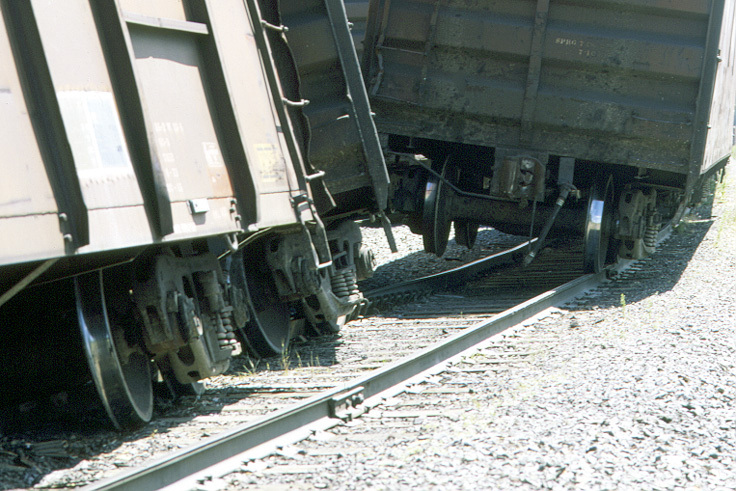 July 1998: A switch problem put a few cars on the ground in the yard at Black Butte. 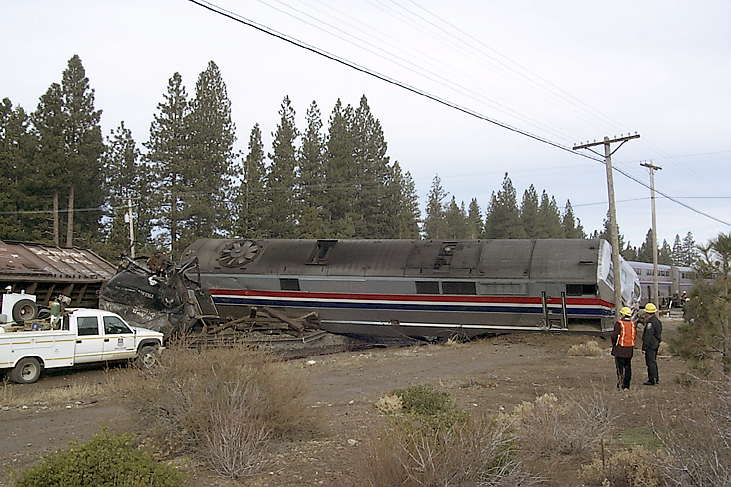 December 7, 2000: At 1:45am, Amtrak's southbound #11 Coast Starlight derailed right at Black Butte. 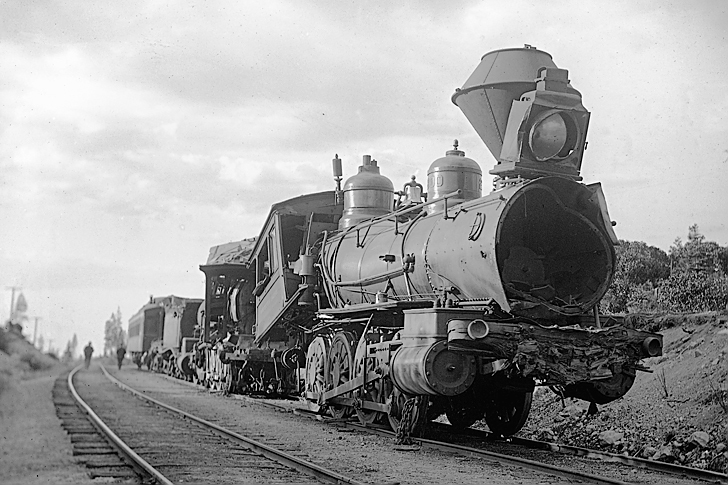 A Central Oregon and Pacific crew had been switching the yard and let a tank car get away from them. It overturned and fouled the mainline, right as Amtrak was coming by. A women engineer was injured. While no passengers were seriously hurt, the derailment triggered a major emergency response. 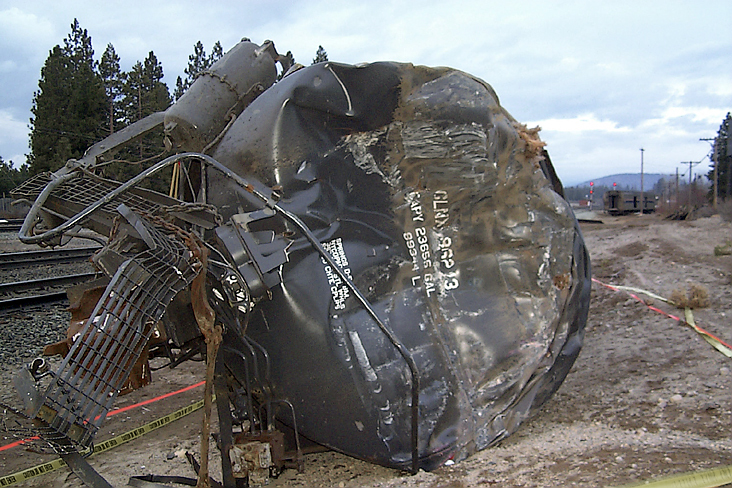 The derailment wiped out the historic spigot of the Black Butte water tank. It was replaced by a [far] less interesting modern version. 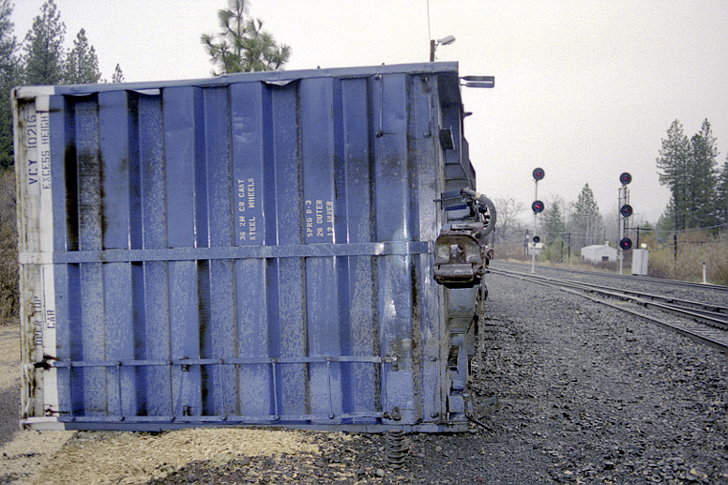 October, 2002: Two loaded wood chip cars derailed right at the railroad crossing at Black Butte. 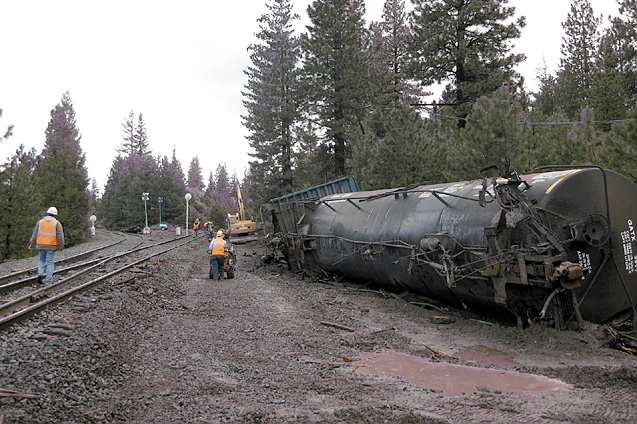 The derailment happened when UP was switching the Black Butte yard. The photo at the top of the page is also from this incident. May 2, 2009: A UP northbound split the switch at the south end of Black Butte siding. Due to fears of a chlorine gas leak from this derailed tanker, the BBCRC was evacuated for the day. We sought refuge at the Hi-Lo Diner in downtown Weed. A local newspaper article describing it can be found on this page. 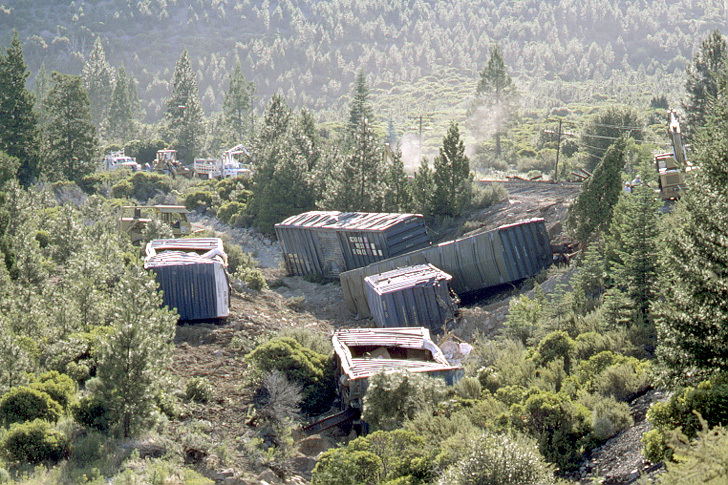 June 4, 2009: Six empty freight cars (gondolas) had a runaway down the Sacramento River canyon between Mt. Shasta and Dunsmuir after they broke off the rear of a northbound UP train. The cars were intentionally derailed by UP before they reached the Cantara Loop, the site of the infamous 1991 derailment and chemical spill.